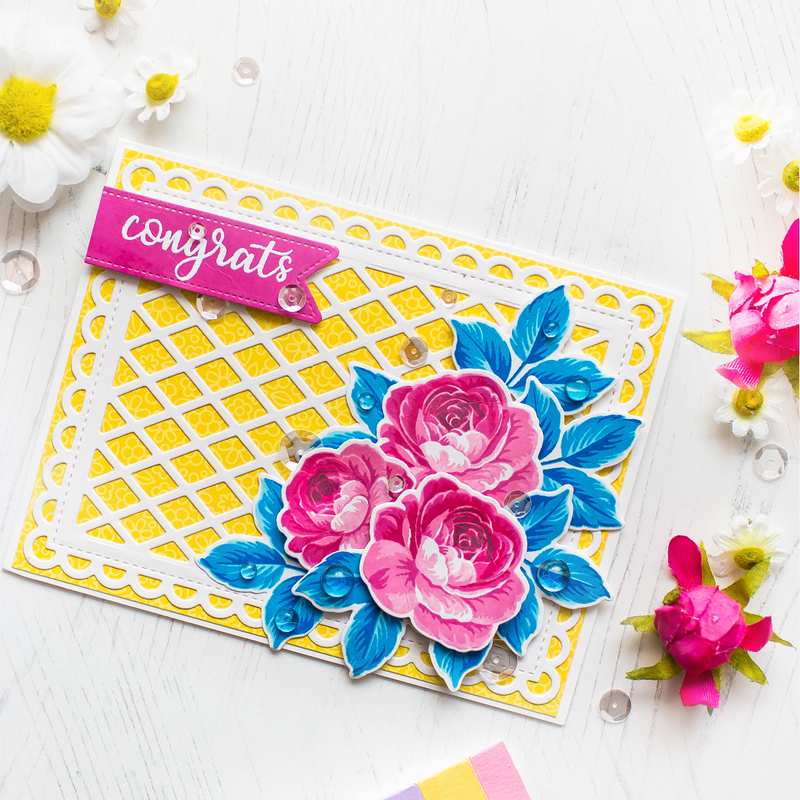 Hi crafty friends, today I am showing you a bright floral card featuring the Frilly Frames Lattice Dies and the most amazing rose stamp set, the Everything's Rosy Stamp set from Sunny Studio Stamps. You can find the used supplies bellow. 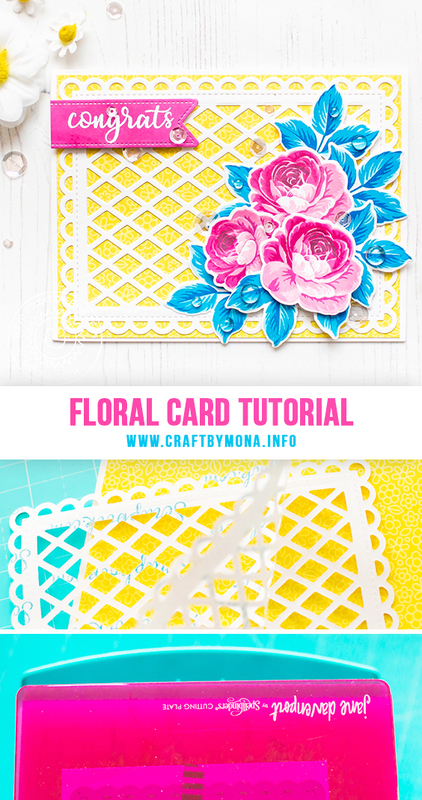 This time I started the card making with stamp layering. For the stamping I used Hybrid Inks from Scrapbook.com. For the leaves I used the Blue Combo and for the rose I used the Rose Combo plus the Rainy Day Gray color for the darkest shade inside the flower. When it was done, I Die-cut the images with the coordinating dies. The next step was the background. I adhered yellow cardstock from the Flirty Flowers paper pad. 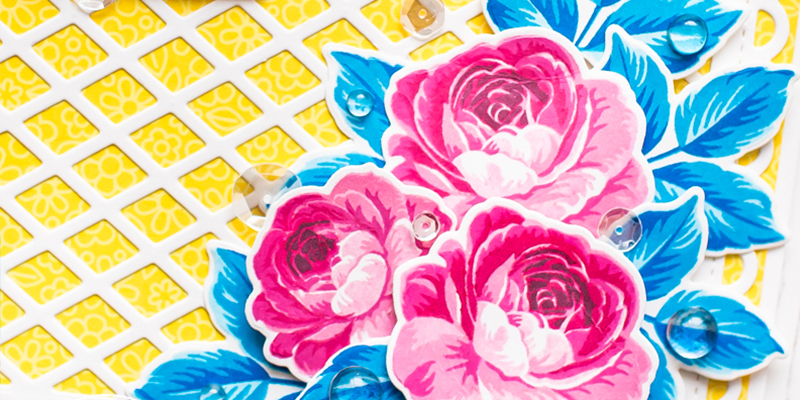 Because these Frilly Frames Lattice Dies are intricate dies I adhered my paper to a 6x6 double sided adhesive then ran it through my Die-cut machine with the Frilly Frames Lattice Dies and voila my Die-cut was sticky! You can see the process on the following pictures. When it was done, I made a banner with the Fancy Frames Rectangle Dies and heat embossed the sentiment. Love that vibrant, electric look! Wouldn't have thought to use blue leaves but it pops nicely! Just love the background die and the yellow really enhances the bouquet of flowers. Nice card! !